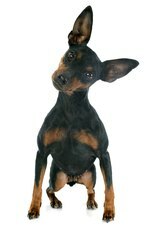 What Is the Difference Between a German Pinscher & Doberman Pinscher? The German pinscher and the Doberman pinscher appear to be similar breeds. A closer look, however, reveals different origins and different characteristics. Although both breeds can be found in the American Kennel Club's Working group, the German pinscher and the Doberman pinscher historically have different tasks and different temperaments. The Doberman pinscher is an excellent companion as well as a guardian and an athlete. The American Kennel Club recognized the German pinscher about a century after it recognized the Doberman pinscher, but the German pinscher is the older breed. The German pinscher, in fact, is one of the breeds used to create both the Doberman pinscher and the miniature pinscher. Originally called the smooth-haired pinscher, the German pinscher was once accepted in salt-and-pepper and unmarked black before those colors died out during World War II. The Doberman pinscher was developed as a breed sometime between 1890 and 1900, by Louis Dobermann, a tax collector. He combined several breeds, including the Beauceron, the German pinscher, the Manchester terrier, the Rottweiler and the Weimaraner, to create a medium-size breed that was both companionable and protective. His specimens quickly gained popularity both as pets and as police dogs. The German pinscher is a medium-size breed that stands between 17 and 20 inches high at the shoulder. The breed has a short coat, close-lying and sometimes hard to the touch. Unlike Doberman pinschers, only black-and-blue-coated German pinschers typically have rust markings. Fawn, or isabella, and red dogs may be solid in color, while reds may also have black hairs intermingled with the red -- stag red. In the United States, the German pinscher typically has a docked tail and cropped ears. If uncropped, the breed's small, V-shaped ears are either semi-erect with a forward fold, or carried erect. The Doberman pinscher is a medium-size dog; a female ideally stands 25.5 inches at the shoulder, a male 27.5 inches. The breed's short, close-lying coat comes in four colors: black, blue, red and fawn. All colors are marked with rust or tan on the face and legs. In the United States, Doberman pinschers typically have docked tails and may have cropped ears. The ears are attached high on the skull. When uncropped, a Doberman's ears are V-shaped and lie close to the dog's head. The Doberman pinscher should have an alert, loyal, fearless and obedient temperament, never shy or vicious. According to the American Kennel Club website, a Doberman may have a "sharp" temperament. Adult males may fight if housed together. Dobermans who get daily periods of vigorous exercise and who are socialized from an early age make loving pets. In addition to being excellent guardians, Doberman pinschers are athletes, search-and-rescue dogs, and service or therapy dogs. The German pinscher is also alert and loyal; however, the German Pinscher Club of America also describes the breed as independent, spirited and "like a mischievous child" in that the dogs require a "firm hand." Strong control, along with diligent socialization and obedience training, will develop the German pinscher's potential as a devoted family pet. Although the German enjoys training and doing things with his owner, he will also test his owner to determine what he can get away with. The German pinscher is not recommended as a pet for families with children under the age of 9. The Doberman is prone to a number of health issues, including cardiomyopathy, hip dysplasia, hypothyroidism, von Willebrand's disease, Wobbler's disease, progressive retinal atrophy and albinism. Of these diseases, only cardiomyopathy and Wobbler's disease cannot be identified by screening tests. The Doberman pinscher has a life expectancy of only 10 to 12 years. However, the DPCA has a longevity project that encourages breeders to certify dogs who live longer than 10 years and those whose family trees reflect dogs selected for their longevity. The German pinscher is also prone to cardiac disease, hip dysplasia and von Willebrand's disease. However, the German pinscher is affected by hereditary cataracts rather than PRA, and is prone to vaccination reactions and complications, including neurological issues as severe as tremors, seizures and brain swelling. According to the Iams website, the German pinscher has a life expectancy of approximately 12 to 15 years.